Happy Late Thursday, lovely readers. Throwback Thursday is a weekly meme that we host where we reminisce about our favorite childhood books. This Thursday, I've chosen Ramona and Her Mother. Beverly Cleary has given books to each member of the Quimby household except Mrs. Quimby. Now she gets her turn at last in a story that hits the high and low points of a working mother's life as seen from Ramona's seven-and-a-half-year-old viewpoint. Inevitably domestic tensions, not without their amusing side, occasionally arise. Mr. and Mrs. Quimby sometimes forget who is to do what, as when the Crock-Pot is not plugged in and dinner remains uncooked. Beezus acquires a ludicrous teased hairdo at the student body shop while Ramona gets a becoming pixie haircut. Ramona, who feels unloved, takes to twitching her nose like a rabbit in a cozy picture book until her teacher becomes concerned that something is making her nervous. Yet Ramona is wrong. She is loved, and readers will rejoice with her when she discovers the wonderful truth. Few writers today are as skilled as Mrs. Cleary at showing families in the round, and here she is at the peak of her powers. 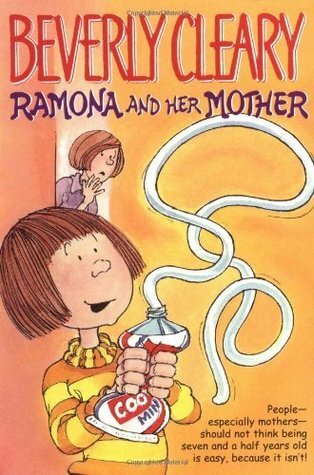 I used to read the Ramona series all the time. This is the 5th book in the series, but I wanted to pick it because this book has always had special meaning for me. I, just like Ramona, was worried that my mom didn't love me as much when I got a new little brother. This story showed me that I was very wrong. Sometimes it's hard to see outside of your own viewpoint, especially when you're seven and a half years old. Perks of Being A Wallflower!! Funny Bone Friday: New Girl Edition!